Get a classy and classic cutting tool from a tried and trusted designer when you choose Columbia River's CRKT 5460 FOSSIL Compact Folding Knife. Columbia River crafts this plain edged blade out of 8Cr13MoV steel, for a hardness of 58-60 HRC, and polished with a satin finish. 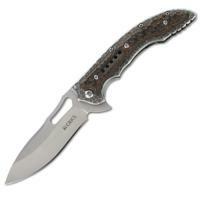 Model CRKT 5460 features a stainless steel handle with G10 overlays in a hammered two-tone style. This folder also includes a frame lock and the IKBS™ ball bearing pivot system. The compact Fossil™ was created at the Brazilian company Presidente Prudente by Flavio Ikoma, and was influenced by his earlier designs, the Sampa™ and the Carajas™ knives.